Charlene Jones, a longtime political and education strategist who managed the Prop 1 campaign, speaks to a cheerful crowd at St. Louis Public Schools' downtown headquarters after watching election results come in. St. Louis voters easily reaffirmed the city's earnings tax, a solid victory for city leaders and a stinging defeat for retired financier Rex Sinquefield. And city residents also approved several other propositions, including a $25 million bond issue and a property tax increase for St. Louis Public Schools. With all of the city's precincts counted, St. Louis residents voted to reauthorize the 1 percent earnings tax with 72 percent of the vote. That's down from five years ago, when roughly 88 percent of voters approved the tax levied on people who live or work in the city. Five years ago, there wasn't an organized "no" campaign. This time, Sinquefield donated more than $2 million toward an opposition campaign. That paid for scores of television advertisements, mailers and signs — materials that were apparently not effective enough to significantly move the needle. In a statement, NO on E Tax spokeswoman Stephanie Lewis said that "over 12,000 voters voiced their opposition to the status quo directly on the ballot." "So, tomorrow begins the next phase of this campaign," Lewis said. " We will begin thoroughly examining city government to find inefficiencies and waste and make specific recommendations for phasing out the earnings tax without cutting police, fire, or vital city services. We will then work with city officials to begin the implementation." Anne Schweitzer, the treasurer of the campaign supporting the earnings tax in St. Louis, said the campaign did bring up some good questions about the tax, especially about how the city taxes its poorest residents. While proponents of keeping the earnings tax were outgunned financially, they barnstormed neighborhood meetings and provided some of their money toward the "yes" campaign. For instance, Slay, who counts Sinquefield as a major donor, donated about $100,000 to the "yes" campaign. State Sen. Jamilah Nasheed, D-St. Louis, and St. Louis Treasurer Tishaura Jones created radio advertisements urging a "yes" vote. Wow, Rex spent $2mil to get less than 30% of the vote. That's not a good investment for a man who made billions on the stock market. "I think you had a billionaire pushing the wall on this as far as he could get it to go, using some very unethical language to convince voters," Schweizter said. "Voters have clearly seen through that." Because of a voter-approved state law, St. Louis and Kansas City residents will have to vote again in five years on whether to reauthorize the earnings tax. 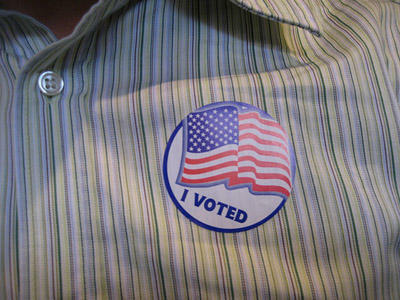 Kansas City voters affirmed the earnings tax tonight with more than 70 percent of the vote. Meanwhile, St. Louis area voters also backed a $25 million bond issuance for capital needs projects. It passed with 82 percent of the vote. The St. Louis Fire Department will be the biggest beneficiary, receiving about $15 million for 10 new fire trucks, seven new ambulances, repairs to roofs and HVAC systems at some of the department's 36 fire houses, and a new roof and generator at fire department headquarters. "We really care about the city of St. Louis, and we are happy that the citizens agree with us to give us the opportunity to get the best equipment available so that we can continue to do the best job for the city of St. Louis," said union president Demetris Alfred. St. Louis and St. Louis County voters approved propositions related to the Metropolitan Sewer District. The first would issue $900 million worth of bonds for wastewater infrastructure. The other would sort out storm water funding and service. St. Louis Public Schools Superintendent Kelvin Adams watches as early results come in showing strong support for Proposition 1. City school officials said the success of their 75-cent property tax increase, which won more than 69 percent of the vote, showed that voters trust the system and the progress that it has made. 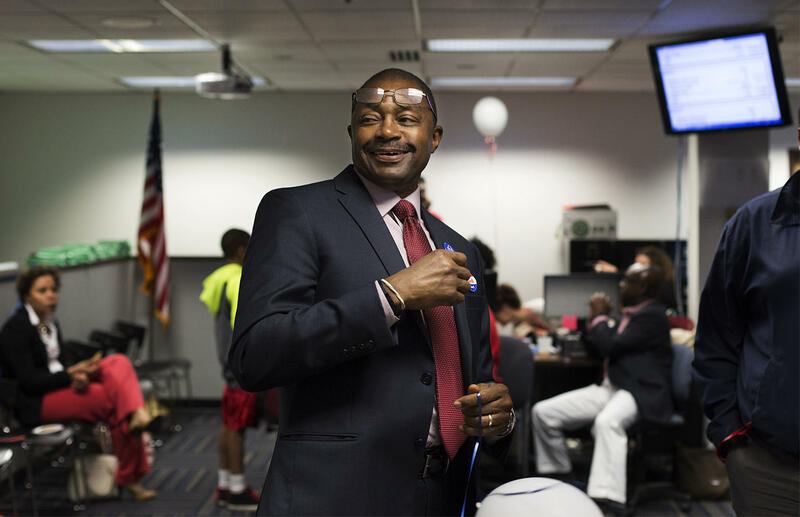 “The city of St. Louis has said to us again, they trust us,” Richard Gaines, a member of the district’s special administrative board who headed the Proposition 1 campaign, told a cheering crowd at the district’s downtown headquarters. Superintendent Kelvin Adams said the money to be raised by the tax increase — about $28 million a year — will be shared after the first two years with charter schools in the city of St. Louis. He said the positive vote shows that St. Louis voters care about education. “This is about citizens of this city saying education is important, and we're willing to pay for it,” Adams said. St. Louis Public Schools staffers watch a television news update while waiting for results on Proposition 1 at district headquarters. In its campaign, the district said the money would go for expanding early childhood education, increasing options for character and alternative education, improving safety and security and making salaries for teachers and other staff more competitive. And, he added, the vote showed that the district has shown its value to everyone in the city, not just parents. Voters also passed tax or bond proposals in these school districts: Jennings, Ladue, Maplewood Richmond Heights, Mehlville and Fort Zumwalt. Meanwhile, Ferguson officials got a mixed result on Tuesday when a sales tax increase passed, but a property tax increase failed. Ferguson Mayor James Knowles III answers question from reporters following a recent city council meeting. Before the city approved a consent decree with the federal government, members of the Ferguson City Council placed a sales tax increase and a property tax hike on the ballot. The sales tax proposal would boost the city’s sales tax rate by 0.5 percent. The property tax item would have increased the city’s property tax rate by 40 cents per $100 assessed value. The sales tax passed with nearly 69 percent of the vote. While the property tax item received about 57 percent, it needed at least 66.67 percent to go into effect. Ferguson City Manager De’Carlon Seewood noted last year that the city was facing a roughly $2.8 million budget deficit. In a memo released last month, Seewood wrote that Ferguson could climb out of its hole with a combination of tax increases, benefit and wage reductions, and making the city part of the county sales pool. But Seewood’s memo said that, if only the sales tax increase passed, the city would have to cut about 19 positions – compared to 10 positions if both tax hikes passed. The memo said the city would have to cut about seven positions in the Ferguson Police Department. Ferguson Mayor James Knowles III said city leaders would have to look "at tightening our belts and look at a few options we have to keep service levels going. "Obviously, we have an August election that may also be an option to going back out for some sort of tax levy," Knowles said. "But these are obviously conversations that we’re going to be having over the next couple of months with our budget sessions. Right now, by having at least one of the taxes, that’s going to keep us being able to move forward to a large extent. [But it's] obviously recognizing that there’s still a sizable gap that we’re going to have to find a way to fill the whole." Asked how Tuesday's results would affect the city's ability to comply the federal consent decree, Knowles said there are aspects of the agreement that require the city to have "additional oversight, additional training, additional activities by our police officers." And obviously, if we have less officers, less staff and less ability to meet those demands — it may be difficult or impossible to actually meet them," Knowles said. "Right now with us going one for two here, we’re not really sure precisely where that leaves us staffing wise. And obviously there’s some things we’re going to be looking at as far as grants and other cooperative opportunities to save money on these consent decree items. We’re not ready to say at this point what exactly it would mean for us. This will all be looked at as part of the larger budget conversation." Ferguson also held three races for city council that were won by Linda Lipka, Heather Robinett and Keith Kallstrom. Lipka and Kallstrom were the only people to file for their respective seats, but they did have write-in candidates running active campaigns. Robinett defeated Bob Hudgins and Annette Jenkins to capture the Ward 2 council seat. St. Louis County’s municipal elections were marred by widespread ballot shortages. Around 7:30 p.m., the Missouri Court of Appeals extending voting hours to 9 p.m. — but some polling places had already shut down for the day. St. Louis Board of Elections director Eric Fey said that any ballots cast after 7 p.m. as a result of the court order would not be counted Tuesday night. He added that he didn’t know when provisional ballots would be added to the tallies. The provisional ballots could matter in cities with close mayoral and city council races. In Berkeley, incumbent Mayor Ted Hoskins defeated Babatunde Deinbo by 38 votes. That north St. Louis County municipality was one of the places that ran out of ballots on Tuesday. In Pine Lawn, Terry Epps bested Kellie Shelton by five votes. In Richmond Heights, Jim Thomson upended incumbent Mayor James Beck by 104 votes. Polling places in that city also ran out of ballots earlier in the day. And in Kirkwood, Tim Griffin easily bested two other candidates to succeed Arthur McDonnell as mayor. St. Louis County and many municipalities there and in St. Charles County were asked whether or not to retain the existing sales tax on out of state and person to person vehicle sales. The effort passed in the county and overwhelmingly in the municipalities. Updated as story develops: St. Louis County’s municipal elections got off to a rocky start on Tuesday, with many polling places quickly running out of ballots. An appeals court extended voting until 9 p.m., but the decision came late. Shortly after 5 p.m., Circuit Judge Maura B. McShane denied a request to extend voting. In a hand-written order, the presiding judge in the county said "the court denies petitioners' request and doesn't believe it has authority to extend the hours." In an email, Eric Fey, Democratic director of the St. Louis County Board of Elections, said, "Any ballots cast after 7:00 pm as a result of the court order will not be counted tonight." Ferguson residents will consider raising taxes next week to fill a big budgetary gap, a potentially critical decision for the beleaguered city. Before the city approved a consent decree with the federal government, members of the Ferguson City Council placed a sales tax increase and a property tax hike on the April 5 ballot. The sales tax proposal would boost the city’s sales tax rate by 0.5 percent. The property tax item would increase the city’s property tax rate by 40 cents per $100 assessed value. On Thursday’s St. Louis on the Air, guests discussed the contentious St. Louis earning tax (Prop E) that goes before city voters on April 5. Proposition E is a vote to either keep or phase out the city’s earning tax. If you are a wage earner and live or work in the city of St. Louis, you pay the city’s 1 percent earnings tax. More background on that here. Thinking on whether the earnings tax is a boon or a bust for St. Louis city is sharply divided. 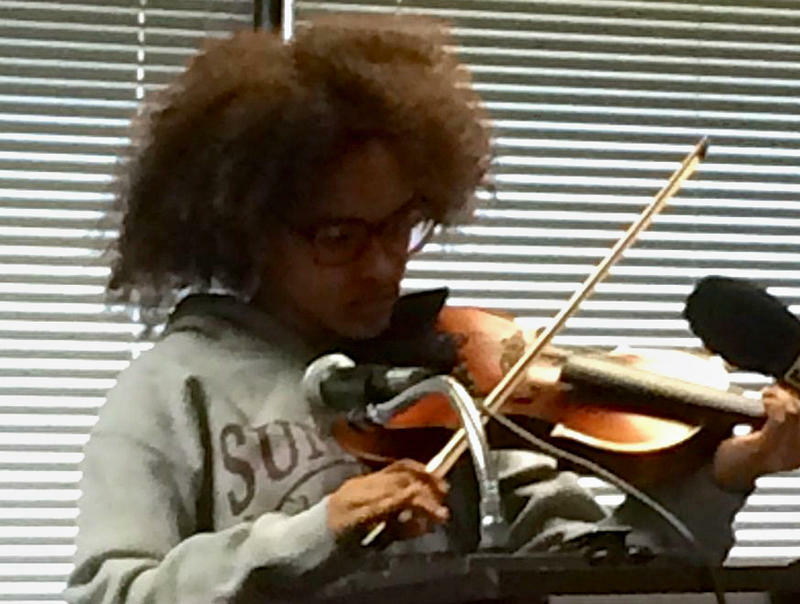 Aimee Clay, a member of the Sumner High School ROTC Drill Team, began playing the national anthem on her violin at the start of the campaign kickoff for the St. Louis Public Schools 75-cent hike earlier this month. Suddenly, clearly upset by an errant note, she stopped. Campaign chairman Richard Gaines stepped up to put his arm around her shoulder. The crowd applauded encouragingly. Aimee regained her composure, started over and played the majestic tune flawlessly to the end.